Yes it does. I can see it in 2001 , 2005 and in 2008. 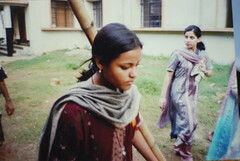 This is in 2001, just after getting into engineering college. No one ever shouted at me for taking a photo before or after. After that day we exchanged many words. She was really angry as I took it.